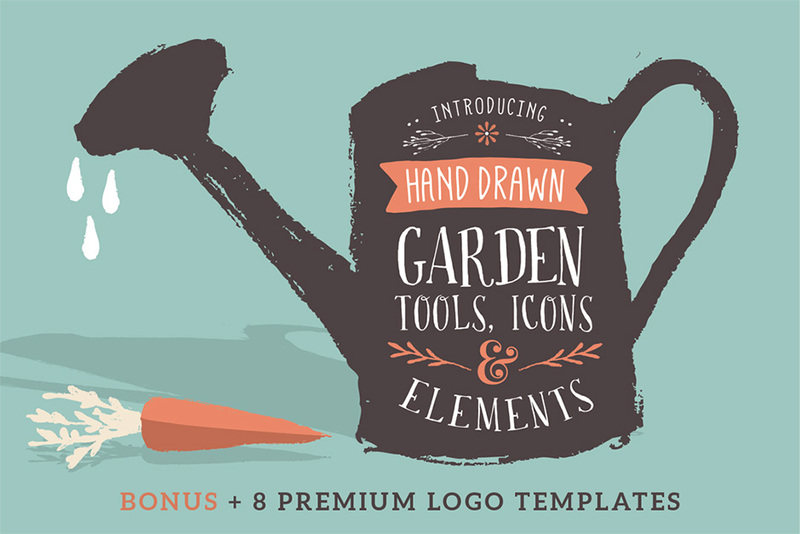 Logos, icons, objects, patterns… with over 65 premium elements, this set has it all! The versatile objects have lovingly been transformed into fantastic graphic tools to save you time on your next garden scape project. The 12 icons have been designed in the ever-popular flaticon style. While the rustic one-color objects will effortlessly transform into objects to be used in posters, websites, logos and more! See the last preview as an example. The vintage color palette adds a fantastic retro look to the elements which are ready and waiting for you to play and have fun with. And the biggest time-saver of all, are the 8 meticulously designed logo templates I’ve included, in both vector (Illustrator) and .PSD (Photoshop) files which are well organized into layers – ready for you to edit and make your own. Fonts are free and download links included. As a bonus I’ve included two playful seamless patterns which are great as an extra brand-building element. Software compatibility: Adobe Photoshop or Illustrator CS3 and newer. .PNG files will work with most graphic software. File size is approx 34MB (50.5MB unzipped), offered as a single download.